Sleep is one of the most talked about elements of new mom life: if you’re getting it, how you’re getting it, why you can’t seem to get it no matter how hard you try. 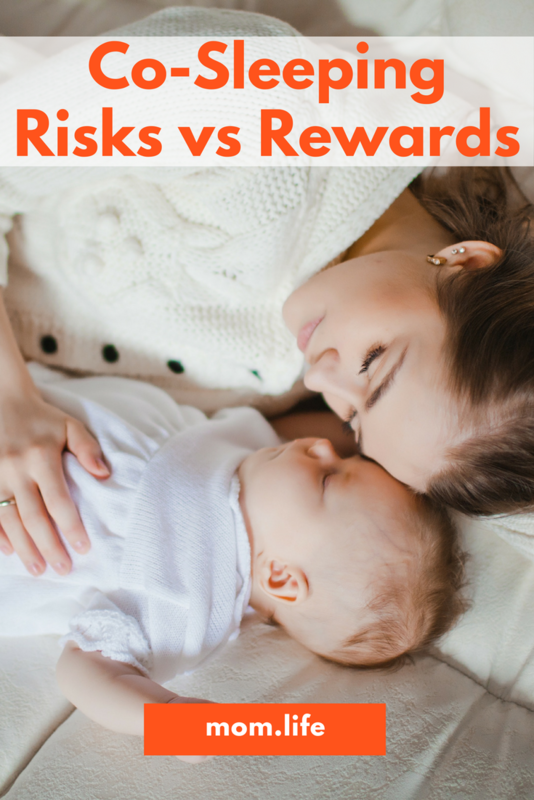 It’s an important part of a healthy lifestyle and, while it seems that it’s all your newborn does when she’s not eating, it also seems like she really never does it when you want her to. The struggle is so very real! For some families the answer is co-sleeping -parents sharing their sleep space with their child. It’s a controversial answer, but one we know many families choose to make. Read on to find out if it’s right for you. The American Academy of Pediatrics recommends parents do not bed share with their infants. The evidence proves that babies, particularly those under 4-months and those with low birth rates, are at significant risk of Sudden Unexpected Infant Death (SUID), including SIDS, and other sleep related deaths. It is estimated that nearly 3,500 babies per year are lost in this way and, the American Academy of Pediatrics notes that the best way to prevent these deaths is for parents to place baby to sleep on their backs, on a firm mattress, in their own crib or bassinet, with no blankets, sheets, pillows, stuffed animals, crib bumpers, positioners or other items. The risk that an exhausted parent could roll over onto their baby is a real one and the blankets often used in a parent’s bed are not safe for baby. Despite these recommendations, countless parents swear by the co-sleeping practice. Many insist that it is the only way mom and baby can get any real sleep and, particularly when it comes to breastfeeding, it makes establishing a healthy milk supply, feeding routine, and sleep schedule so much easier. When it comes down to it, while some parents make a conscious decision to co-sleep, many parents don’t begin bed sharing intentionally -it is a natural progression of what occurs as exhausted mothers wake up countless times throughout the night to feed their new babies. You crawl back into bed with baby to nurse and both of you drift off while feeding. The American Academy of Pediatrics notes this too, explaining that they get it: moms fall asleep while nursing. What they want you to do is stay awake and move baby back to bed when you’re done, what they realize is real life is that you may not do that. Further research has led them to support the following: if you’re nursing, do it in bed instead of on the couch so that if you fall asleep with baby, you will be in a slightly safer situation (falling asleep with baby on the couch or in a chair was found to be more dangerous than sleeping with baby on your bed). Be sure to read the official sleep guidelines from the American Academy of Pediatrics to learn more. Now, real talk, as a mom who co-slept with three children (separately, not together), I have some tips for how we made it work for us. This is not an endorsement of an unsafe practice, rather an anecdotal story of how and why we made this choice. As a parent who breastfed exclusively for the first 6 months with each of my boys (meaning, nope, they didn’t take a bottle until they were 6 months old and then we went straight to a cup), making the choice to co-sleep just came naturally. Co-sleeping made it easier for both of us to establish a healthy nursing routine as well as a reliable sleep routine. And also, I loved it. I liked having my boys within arms reach and I always felt like I could sleep better with them there. I think they felt the same as none of them did well with the arms to bed transfer or slept much at night when I attempted to force the sleep-in-your-own-room rule. For safety purposes, I kicked my husband to the curb. I didn’t feel safe sleeping in the bed with all three of us, so for the first few months he would sleep in our guest room. It wasn’t an issue with my first, but with my second and third babies, I didn’t allow my other children into the bed with us. They could cuddle with dad if they needed something at night. I also removed the blankets from the bed. We kept the room warm and baby and I would wear appropriate nightwear. If I got cold, I’d just grab a throw for my side of the bed and leave baby asleep on the other side. It was a big bed so he could have his own space while I could also have mine. As my children got older, the co-sleeping went from all night to getting in bed with me half way through. We just put them to bed in their crib in our room and then, when they woke for night feeding my husband would hand me the baby as he went to get more sleep in the guest room -we’d usually sleep the rest of the night together. When night feedings were eliminated, they just continued to get into bed with us as they felt the need. Sometimes, they still crawl in and they are all elementary school aged now. We’ve never had a situation where my children didn’t feel welcome in our room, and I feel like we are very close because of it. I realize that co-sleeping isn’t for every family, but if it is something you’d like to try, I think you can do it with a clear conscious. Read More: This is how you get your baby to sleep through the night.